Kettlebells are one of the most versatile exercise tools that a person can employ. They take minimal space but deliver maximum benefit to your workouts. One of the hardest choices a new-comer to the kettlebell culture encounters is what style of kettlebell they should buy for themselves and start training with. There are quite a few different styles and shapes to kettlebells their weight aside. The first thing to consider when choosing a kettlebell is what are your goals with procuring a kettlebell? – Is it going to be a household exercise tool or be used outside? – Is it for building strength or more conditioning focused? – Will you eventually want to use single hand work or will you be mostly focused on using two handed grip techniques? 1. There are some Kettlebell styles that have a plastic coating to make them more conducive for inside use – For outdoor use there are powder coated kettlebells that make them more resilient to the ele-ments. I personally like the powder coated for inside and outside use. 2. To be clear ANY kettlebell training will have strength benefits, but if you are more conditioning focused then you will want a weight that you can move around with some general ease so you can focus on the exercise techniques. The different weights of kettles (other competition kettlebells which stay the same dimensions no matter the weight) will change is size as the weights change and this can effect your techniques. *A tip to consider – Regardless of style of training I do recommend using Sport style kettles due to their consistent size and shape. This will allow the movements you learn to stay the same as you progress in weight if you so choose. 3. Most kettlebell techniques can be done with two hands. This makes them more stable and easy to learn for novices. Using single hand techniques will rise the challenge and technique level considerably. If you do not seeing yourself wanting to try single hand work for some time then you will be using two hand movements so you will want to have a kettlebell with ample handle space. A solid unique design that has a consistent size and shape, like Sport style kettlebells, but also have a decent size handle shape like the powder coat kettlebells are the Kettlebell Kings Steel Standard Kettlebells. Now that you have determined your goals with kettlebell it is time to determine the proper weight. Quality kettlebells do cost money so you have to make sure when you make the investment that it is going to be the right weight for your goals. Of course as you increase your strength and technique you will eventually need to go up in weight. but this could take some time; so you can get a lot of mileage off of the right kettlebell. Of course this is a difficult choice to determine since there are many variables involved. Injuries, experience, current fitness level, etc. In most kettlebell training styles 8 kilogram (about 17 lbs) and 12 kilogram (about 25 lbs) are the classic starting weights. Usually, especially for two hand movements, the 12 kilo size bells are a great novice challenge. If you have some kettlebell or weight resistance experience then the 16 kilogram (about 35 lbs) is a standard starting point. If with the weight you choose you can do 12 or more reps with the 12kg kettlebell in one move, lets say the goblet squat, at once with relative ease it may be too light for you in that exercise and you may need the 16kg. You can use this example for all the exercises you may be planning on doing. It is important to consider your current level of fitness, but also know you WILL get stronger and also consider. With proper training and consistency you may be surprised how much stronger with your kettlebell you will become. Hopefully this easy checklist will help you determine what kind of kettlebell is the right one for you. It is always exciting to get a new kettlebell, it is like getting a new workout buddy who is ready to help you create the strongest version of yourself. If you can, and you are a kettlebell novice, seek out some professional coaching to learn the basics for you to build on. Sometimes in person is tough, if so then look for a good coach who offers online coaching. If this is also out of reach then subscribe to the Kettlebell Kings blog, and YouTube content for kettlebell technique videos and articles and weekly kettlebell workouts to add to your fitness routine. 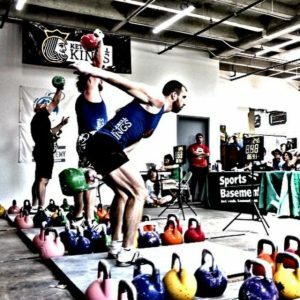 Kettlebell Kings is based in Austin, Texas and offers high quality kettlebells as well as tons of free content to read and learn about kettlebells on our blog. 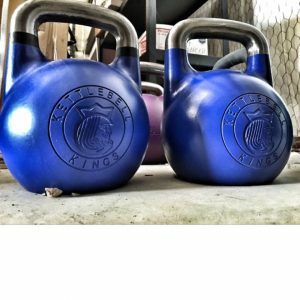 Kettlebell Kings was the first company to offer Free Shipping and Lifetime Warranty on all kettlebells. We also create free, weekly workouts you can sign up to receive in your email in box here.